Now it’s really over. The electoral college vote is finally in the books, and Donald Trump is free of any remaining electoral hurdles to becoming the next President of the United States. The electoral votes aren’t formally counted until early January, but it’s now basically official; we’re looking at the end of President Obama’s time in office and the beginning of President Trump’s on January 20. I need a blueprint for dealing with the Trump Administration. As this reality continues to settle in for America and the world, I’d like to share a simple blueprint for dealing with Trump’s administration, for however long it lasts. From the looks of his continued hyper-Nixonian tendencies, which I’ll elaborate upon below, and his many alarming Cabinet and White House staff choices, there won’t be many things on which I’ll be able to support him. I know a lot of other liberals and progressives feel the same way. As a Christian ever since childhood, and also as a former longtime evangelical Christian minister, I’m used to going to the Bible for wisdom in difficult times. My little blueprint for how to relate to the Trump Administration comes from that. More specifically, it comes from what Christians call the Old Testament, but which Jesus and other Jews through the centuries have called the Tanakh. The sections that most inform my blueprint are found there, among the histories of the kings of Israel. 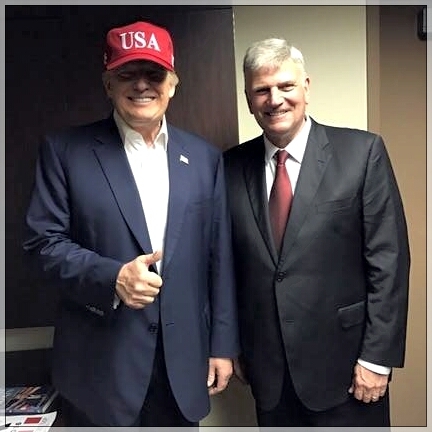 Trump and Graham in Mobile, Alabama, on Dec. 17, 2016. Photo: Christian Post. The comparison is made because while he was king, David secretly took for himself the wife of a man named Uriah. Uriah was known as a good man and a dedicated member of David’s army. Yet when Uriah’s wife became pregnant with David’s child, David arranged for Uriah to be killed by leaving him alone on the battlefield against their enemy. Still, David is called in the Christian Scriptures a “man after [God’s] own heart” (1 Samuel 13.14), and he is acknowledged as the author of much of the biblical book of Psalms. Graham, Falwell, and others say that just like God used David, God can use Trump. David, they reason, was rough around the edges and had a checkered past, yet he did great things for Israel. But this comparison to David is fundamentally flawed. The main reason the analogy fails? The Bible shows that David didn’t accomplish much good after his horrific choices. When confronted over his sins, he was deeply sorry and threw himself at the mercy of God, asking for forgiveness (2 Samuel 12.7-23; Psalm 51). But though God forgave him, He did not exempt him from the consequences of his actions. David’s family fell apart and the kingdom suffered greatly, even plunging into civil war when Prince Absalom sought to usurp the throne. So when Christian preachers say that God can use Trump because he’s like David, they lack a biblical basis. Further, it should be noted that David is only called a “man after [God’s] own heart” before his reign. He is not called that at the end of his reign; in fact, near the end of his life, he is prohibited from building the Temple because God considers him a “man of war” and a man of bloodshed (1 Chronicles 28.3). 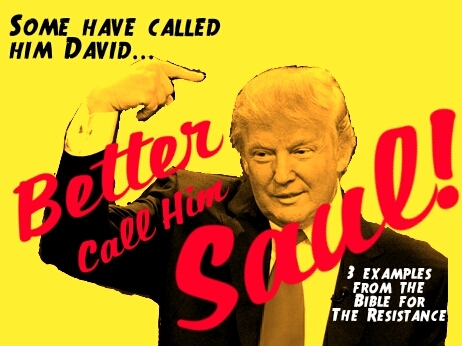 The much more accurate analogy to Trump in the Bible is King Saul. He was the first king over Israel and the predecessor of David. Many of these characteristics are abundantly apparent in Trump as well; the campaign was full of examples. It is actually remarkable how much Saul and Trump have in common. But please don’t get me wrong. I sincerely hope Trump loses these Nixonian traits, which he appears to possess in even greater degree than the disgraced former president. Yet realistically, given human nature, we can expect him to continue to be who he has shown himself to be. The simple blueprint that I see in 1 Samuel for life under Trump has three parts. 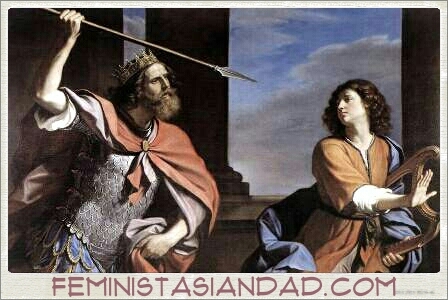 Saul Attacking David. Guercino, 1646. First, I need to hold to my values and not descend to the meanness that characterizes Trump and some of his supporters, especially those who troll his critics online. David sets an example through his years-long, life-and-death struggle with King Saul. In his younger days, when he was a musician in the palace, David survived near misses from Saul’s spear on two separate occasions. Later, when Saul was chasing David around the kingdom, seeking to kill him and killing people who helped him, David had two point-blank chances to kill Saul. Yet David refused to strike him because Saul was “the Lord’s anointed” – in other words, God’s chosen king for that time. Second, I need to be prepared to intervene to protect those threatened by injustice. In 1 Samuel 14.24-46, Saul is dead set on killing his son Prince Jonathan because he had violated Saul’s ban on anyone, military or civilian, eating before day’s end. All Jonathan had actually done was to taste a bit of honey, without having any awareness of his father’s order to refrain from food. But Saul’s soldiers protested vehemently and vowed they would use force against the king and anyone else who would harm Jonathan. Saul stood down after that. 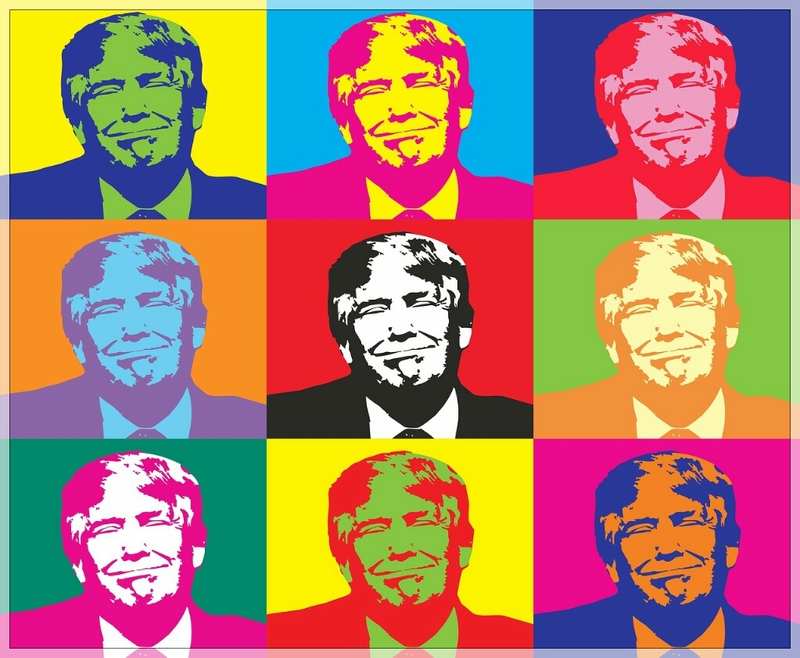 There are several groups that Trump threatened with one thing or another during the campaign – immigrants, Muslims, refugees, women that he victimized sexually who dared to tell their story publicly, and so on. There are even more groups who have been victimized by a segment of his supporters who commit hate crimes in his name. I must stand with all of these oppressed groups. Not showing on your favorite cable TV channel. Third, I need to tell the truth. Throughout the account of Saul’s life and reign, the people that are portrayed positively or sympathetically by the historian author are people who tell Saul the truth. They do this even though they know Saul is highly mercurial in temperament, and that to cross him is to risk their lives. The prophet Samuel, Prince Jonathan, and Saul’s soldiers all boldly stand up to him and refuse to soft-pedal their disagreement and disappointment. It’s always important to show the proper respect to everyone. Yet it’s also essential to boldly stand up to governing officials and to speak the truth plainly when they are hurting people. This must be done without descending into the rudeness and crudeness that Trump often uses in his own speech. Again, I do hope and pray that Trump changes dramatically, especially now that he is vested with more power, humanly speaking, than any other person on the planet. But if he does not, and he seeks to do the oppressive things he proposed during the campaign, I must still stand against him. 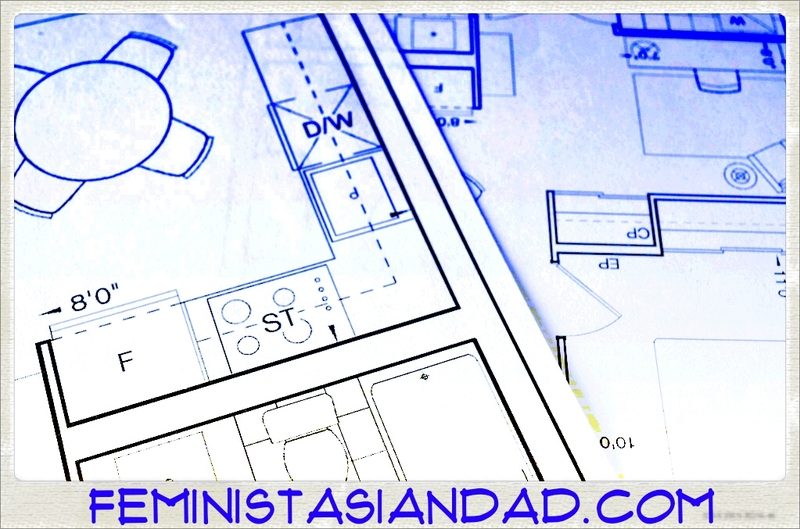 As I do, I’ll be thinking of my simple little blueprint.